Heroes of Legionwood Character Building Guide! 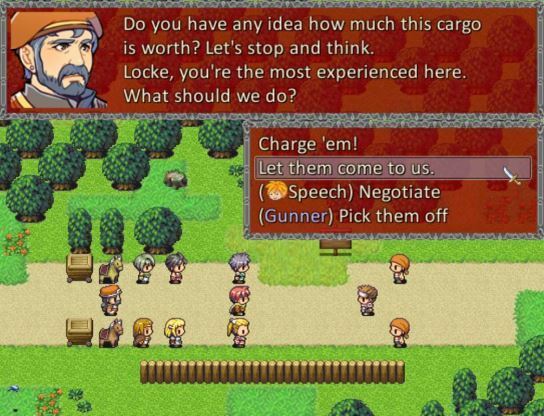 Just like the previous games in the series, Heroes of Legionwood features a fairly diverse character building system, at least for an RPG Maker title. 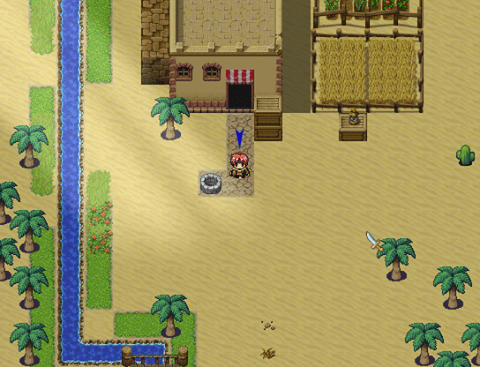 One glaring limitation with RPG Maker is that it’s often quite difficult to provide detailed information on game mechanics, and a common request from players is for an easy way to understand just how everything works. It’s taken a while since there was just so much to cover, but here it is! This Steam guide is an official reference document detailing everything you need to know about character advancement in Heroes of Legionwood – how stats influence combat, a full list of techs and suggested roles for each class. If you’re the type of player who likes to plan out your character before starting a new playthrough, you owe it to yourself to take a look! Heroes of Legionwood: End of Days is coming July 28! You’ve been waiting for the end, and it’s finally here. After a hectic few months of beta testing, balancing and bug hunting, we’re happy to announce the chosen release date for Heroes of Legionwood Episode 3, which will be dropping on July 28th, 2017! our website[darkgaia.com], https://darkgaia.itch.io (along with the previous two episodes) and IndieGameStand[indiegamestand.com] at midnight, 12:00 AM Australian Eastern Standard Time on this date, with the Steam version to follow soon after. DRM-free versions of the game will be standalone executables and, much like the IndieGameStand versions of Episodes 1 and 2, will not require ownership of the previous installments to purchase. The Steam version, as per usual, will be DLC. Save files will be cross compatible between all versions. It’s important to note that, like all Dark Gaia Studios titles, the Steam release will be handled by our publisher, Degica, so the Steam release may not coincide exactly with this projected release date, but we will do our utmost best to try and make sure all versions release at relatively the same time. We’ll also be discussing the possibility of a “Complete Set” containing all 3 episodes at a discounted price, but this is still a ways off. Are you ready to save Legionwood from the Darkness once and for all? So, this is it. Despite numerous delays and quite a few missed release dates, development of Episode 3: End of Days is in the home stretch. Beta testing has begun in earnest, and we’re busy adding the final touches to the game’s content and balancing everything to make sure it plays as smoothly as possible. As such, this isn’t really a devblog that goes into detail about any one thing (since I don’t want to spoil everything this installment has to offer) but is instead a kind of brief round up of some the cool things we haven’t mentioned yet. While previous episodes weren’t light on puzzles or dungeon obstacles by any means, one thing they all seemed to have in common is that they were very passive. 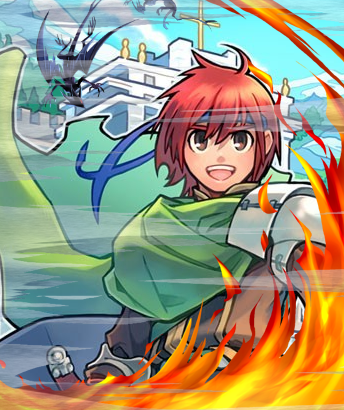 Aside from some of the stuff in the Weave in Episode 1, there hasn’t really been much in the way of active, timing based minigames or challenges in Heroes of Legionwood. Episode 3 contains a brand new stealth challenge (two of them, in fact, but they’re mutually exclusive and you’ll only see one in a given playthrough) where you have to sneak through a dungeon undetected. Stay out of sight and carefully dodge between hiding spots and you may just make it through without any trouble. Bring along a character with the Subterfuge talent and you’ll have a number of extra options at your disposal. If you don’t want to do things the quiet way, don’t fret, as you can just choose to fight your way through if you really want to! As mentioned in a previous devblog, one of the main design goals of Episode 3 (and one of the ways in which it differs a little from previous installments) is a focus on player choice and non-linearity. Going hand in hand with the revised talents system, every quest in End of Days contains multiple solutions or different variations depending on your talents and previous choices. There are more Speech checks than ever before and almost every major NPC can be persuaded in some way. When entering some areas, you’ll be given multiple different ways to proceed (such as sneaking through or going for a no-holds-barred assault). Lesser used classes such as Gunner and Shaman have special options in certain quests to give them more utility. Even seemingly minor talents like Mercantile and Scouting may be put into use to even the odds in a couple of encounters. In an attempt to return to Episode 1’s larger scope after spending most of Episode 2 in the city of Port Alexis, End of Days features an increased emphasis on outdoor areas and overland travel rather than dungeon crawling (though there’s still certainly plenty of indoor dungeons to plunder). You’ll cover quite a lot of distance in Episode 3 as your journey takes you across the vast Sonoran Desert, through winding canyons and even to places beyond Legionwood itself. Make sure you’re stocked up on supplies and bring along a character with the Scouting talent to make your travels a little easier. Finally, we want to give you a glimpse at the ending. End of Days has 3 main endings, unlocked by conducting research into the Darkness, and each of those has variations depending on your choices throughout all three episodes, how you handled certain quests, your romance (or lack thereof) and your character’s overall morality score. If you’ve played any of the Fallout games or the original Dragon Age, you’ll be familiar with the ending slides describing what happens to each of the locations you’ve visited after the events of the game and what impact your character had on them. End of Days does something pretty similar, and we’re confident that you’ll be happy with the story’s resolution. That’s all for now, but stay tuned for release date info and a couple of final announcements. We’re nearly there, folks! This update is kind of a devblog and patch notes in one as it’s time to go into detail about Episode 3’s overhauled Talents system – something we’re also porting back into Episodes 1 and 2 with today’s 2.0 patch. In contrast to Episodes 1 and 2, where Talents were pretty much a binary flag (either a character has it, or they don’t) the game’s most used Talents now come in three consecutive rank: Basic, Advanced, and Master, representing increasing levels of aptitude. Speech, Subterfuge, Mercantilism, Herbalism and Alchemy have all been split into these three ranks (Knowledge, Medicine, Awareness and Scouting remain unchanged) and how they work has been drastically changed. Speech now gives your character a base 50% chance of successfully persuading an NPC (previously, you always succeeded no matter what), with the Advanced rank bringing this up to 75% and Master making it succeed all the time. Subterfuge now works similarly to Speech, giving you a base 50% chance of disabling traps or finding hidden passages (and it’s now possible to fail and permanently break the trap/passage mechanism), with Advanced and Master ranks increasing this chance to 75% and 100% respectively. Mercantilism now grants you a 25% discount when purchasing items from shops, with Advanced increasing this to 50% (the previous base game value). Where Mercantilism is really different, however, is with the Master rank, which expands the inventory of most shops in the game and unlocks rare, special items for sale. Herbalism works the same at its Basic level. However, the Advanced rank causes more harvest spots to appear in the game, and Master makes the rarer herbs (such as Harp Leaf and God’s Mint) much easier to find. Finally, Alchemy also works the same at its Basic level, but becomes much more useful at the Advanced and Master levels, which expand the number of mixable items and reduce their costs by 50%, respectively. Needless to say, these changes allow for many more options during character creation and give your characters something to strive for outside of combat, which brings us to the 2.0 patch. In order to maintain consistency between all three episodes, we’re also implementing this system in End of Days and Resurrection, along with brand new and revised skill checks to make use of the new ranks. Your characters in the first two episodes can now access the Advanced and Master ranks of these talents, and they’ll actually unlock new content in the game. Development of Episode 3, End of Days, is coming along smoothly, so I thought I’d treat you all to a series of dev blogs detailing several of the game’s features and plot elements. In terms of design philosophy and goals, End of Days is actually a little different to previous installments of Heroes of Legionwood in a few notable ways, and I thought it’d be interesting to go into detail about what exactly you can expect. The first notable difference between End of Days and the previous episodes is its scope and quest structure. Funnily enough, this is simply carrying on a pattern already established by Age of Darkness and Resurrection, which were both subtly different. 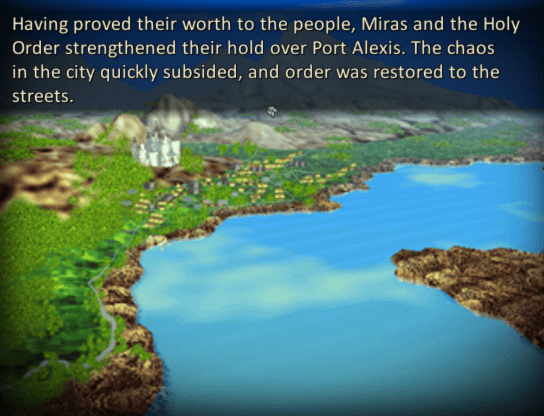 Episode 1, Age of Darkness, focused on a journey over a relatively large geographical area, featuring several towns and sidequests requiring backtracking to previously visited locations. By contrast, Resurrection‘s structure was much tighter, featuring adventures set inside and around one city with a little less linearity. 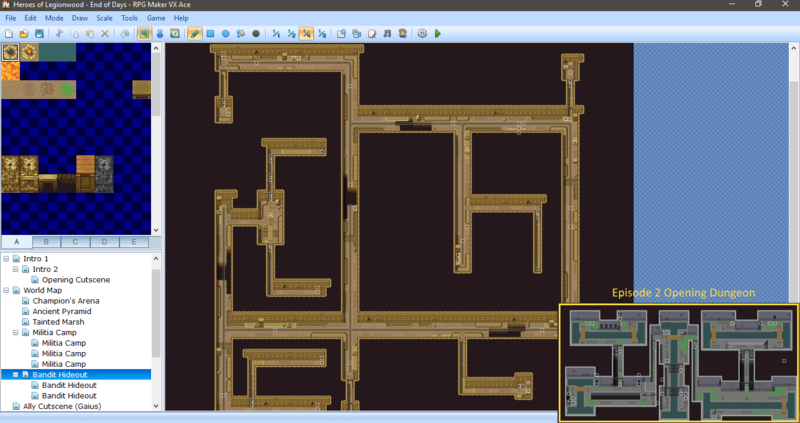 As you can see, in terms of sheer size, Episode 3’s dungeon is definitely bigger, but there’s more to it than that. Unlike Resurrection‘s opening dungeon, this cave in Episode 3 has different versions depending on how you ended the previous installment, with different enemies, a different objective and alternate ways through. There are a number of skill checks and talent uses that affect the difficulty and the boss fight, too, and provide options for different party builds. Compared to Episode 2, there’s simply more content here – what might have been reserved for optional sidequests is right there in the story dungeon instead. The trade off, of course, is that there’s less of a focus on the optional stuff this time around. Side quests still exist, of course, but they’re much simpler and there are fewer of them, at least compared to stuff like the shipwreck exploration or the Champion’s Arena in Resurrection. Most of this structure is due to the scope and context of Episode 3’s story. Basically, the stakes are high in End of Days (hence the title). The Darkness is finally descending, and you’re racing against time to re-unite the Lore Shards and stop it before there’s nobody left to save. You’re not simply searching for something, like in Age of Darkness, or engaging in faction politics like in Resurrection. With that in mind, it doesn’t really make sense for your characters to be meandering around doing sidequests. Instead, you’re moving quickly from one self-contained area to another in a linear fashion, but in each area there’s much more to do and more scope for your choices to affect the story itself. We’re wrapping up story arcs here – it’s all about building up to a satisfying conclusion. And that’s all for now. Join us again next time and I’ll go into detail about how exactly we’re going about this. Episode 3 is where the consequences for your choices will finally start to manifest in a big way. Long time no see, adventurers! It’s been a while since we’ve posted an honest to goodness dev diary about Heroes of Legionwood, so we thought we’d just report in and let you guys know what’s going on with End of Days, the third and final episode of the game. The good news is that work on Heroes of Legionwood: End of Days is well underway and, despite some initial hurdles and delays, we’re well on track to release early next year. We don’t want to reveal too much about the content of the episode at this point (mostly because some of it still subject to change) but in terms of story and player choices this is going to be the biggest installment yet, and simply taking into account everything you may have done so far in Episodes 1 and 2 is no mean feat! Different opening questlines depending on your faction choice in Episode 2. Continuation of your companion friendships, rivalries and romances. Branching mid-game questlines to account for even more choices. The chance to permanently lose party members. More revelations about the Darkness and hints concerning its origins. At this stage, we’re aiming for a February 2017 release, but this isn’t set in stone as this episode is easily the most ambitious one we’ve done so far. Stay tuned towards the end of the year as we’ll slowly dole out more previews and info about the episode’s content and story. If you haven’t noticed, at Dark Gaia Studios we’ve been on a bit of a DLC binge lately. Back in June, we released the Combat Overhaul for Legionwood 1 on Steam, followed by a nice helping of engine upgrades in July. Last month, the Director’s Cut DLC for Legionwood 2 went live, adding extended endings and a slew of other cool things, hot on the heels of the long-awaited Journey to Charn expansion. All of these additions are part of a plan to refresh our existing games throughout the latter half of 2016, to bring something new to the table even while we’re busy working on Episode 3 of Heroes of Legionwood. Now, with the Legionwood series squared away, we’re finally turning our attention to something altogether more horrific as we proudly announce Edge of Madness, a free DLC for 2015’s Lovecraftian adventure RPG Mythos: The Beginning which will be available this October. Probably the biggest DLC we’ve done so far, Edge of Madness is a free update for Mythos: The Beginning which adds over 2 hours of new, playable content while also building upon and overhauling existing game features. Unlike any of the Legionwood DLCs, Edge of Madness makes a bunch of detailed changes to the original game, and even contains some complete system rewrites. We’ve never overhauled any of our games to quite this degree before, but the major goal of Edge of Madness is to make Mythos feel like a brand new experience. The reason for such a huge update is pretty simple. Looking back over the last 12 months since its original release, it’s clear to see that Mythos is probably our most polarising game. This isn’t really surprising. From the very onset, Mythos’ design was bound to be hit-and-miss; as an RPG trying to be a survival horror adventure game, it was never really sure what audience it was trying to capture, and a number of pretty glaring design flaws (mainly in the combat system) didn’t help. This is kind of the point of Edge of Madness, then – it’s an attempt to “reboot” the game, consolidate its confused design into something more focused, add depth to the RPG elements while keeping the horror intact, and turn Mythos into something that’s actually fun to play. I’ve always felt that Mythos works as a survival horror game, but a large reason it didn’t resonate with players is because it didn’t quite do anything interesting as an RPG. Skill checks were too arbitrary and combat was either too hard or outrageously broken, depending on your character, meaning most builds turned out the same. In Edge of Madness, we’ve overhauled the entire combat system and completely rewritten the skill and damage formulas. Combat is now a viable option, and different character builds feel more meaningful. You’re now able to select your character’s starting talents and skill checks are far more prominent in the game world, giving you more ways to progress through a given area. One of the more glaring criticisms of the original game was the dialogue. It was voice acted (and pretty horribly so), which limited how much input the player’s choices could actually have on a given conversation. In Edge of Madness, the heavily panned voice acting has been removed and new lines have been added to flesh out the conversations. 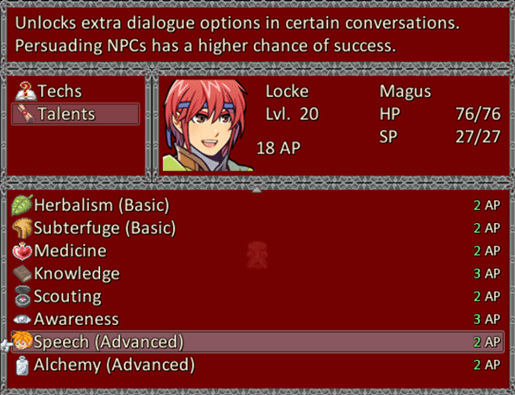 NPCs now have more dynamic reactions to what the player says and will exhibit more autonomy. If you’ve offended somebody, or made them lose confidence in you, it’ll now be far more obvious. 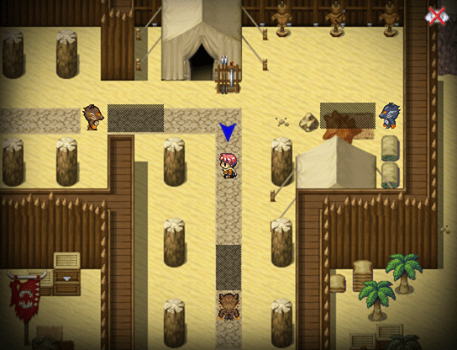 In addition, all of the game’s endings have been expanded with extra scenes that provide more resolution to the player’s choices, making them feel more weighty. Since we’re focusing on making Mythos feel more like an RPG, that means we have to address length and pacing. At ~6 hours long, Mythos is a pretty short RPG, even for an RPG with a heavy emphasis on adventure game elements. While Edge of Madness won’t turn Mythos into an epic, it will (hopefully) make the pacing feel a little more natural. Most of the new content is interspersed throughout the mid to late game, where good scares are noticeably lacking in the original release, and focuses on psychological horror. From a first person dungeon crawl in an underground cavern to a paranoia filled chase through a dense forest, there’s plenty of new stuff to prevent your character growing complacent. There’s plenty more in Edge of Madness that we haven’t mentioned, but this dev blog is getting a little too long as it is. Trust us when we say Edge of Madness will make Mythos feel like a brand new game. It’s coming for you this October.